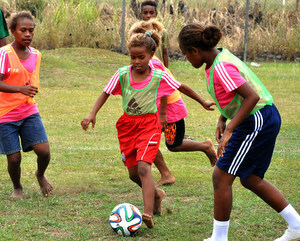 Organised by the Solomon Islands Football Federation (SIFF) women’s development office, the festival was run under the ‘Live Your Goal’ theme promoting FIFA’s message for driving the development of women’s football throughout the world. The festival was funded by FIFA who also provided materials including giveaway t-shirts for the participants. Adrian Wickham, member of the SIFF normalising committee opened the festival with a brief speech acknowledging FIFA for their support to promote football for women in Solomon Islands. “Looking out I can see that we have many female football players, thus, the challenge is for the women’s department to come up with the right programmes to utilise the talent and passion they have,” says Wickham. Locally, the event was used to communicate to young women the real option of playing football as a sport as they grow up. The launch of the inaugural national women’s football league in September was also one of key messages promoted over the two days. At the same time the event served as a practice ground for female coaches who attended the recently held FIFA Women’s Refresher Course. Local female coaches took the lead to organise the event which centered on football fun games and drills which brought out of lot of enjoyment and laughter from the participants. With the number of participants two venues were used to host the event namely Lawson Tama stadium and the SIFF academy pitch. The person behind the event, Diane Justus; head of the SIFF women’s development office, explains that the aim of such festivals is to encourage young women to see the sport of football as an option for them. “I firmly believe that the event was successful and our message of promoting opportunities for women footballers was well received by our participants and the community. The turnout itself indicated the level of success especially since we did not have equipment to cater for everyone that turned up,” says Ms. Justus. Ms. Justus also acknowledged that she herself was taken aback by the desire and interest shown by the young girls who took part in the festival. “It was an eye-opener of sorts for me especially looking at how the girls enjoyed the sessions that were run for them. They played with such great interest and passion that am thrilled about what can be achieved in the future working with these kids. Not only that, but the girls were well supported by their peers (boys) who came out to support them so it was very positive,” Ms. Justus says. “The challenge will be for us establish a pathway for girls to start of their training. From basic training they can move to clubs and play in competitions that will help them mature and become competitive footballers,” says Ms. Justus. The SIFF women’s development office is wasting no time in getting their proposal to the ground and will hold the first combined football excellency programme as early as the end of the week. Interested children are asked to turn up at the SIFF academy and register to take part. Ms. Justus also thanked the schools and communities that participated and all the women coaches and women’s national team players who assisted with the coordination of the event.